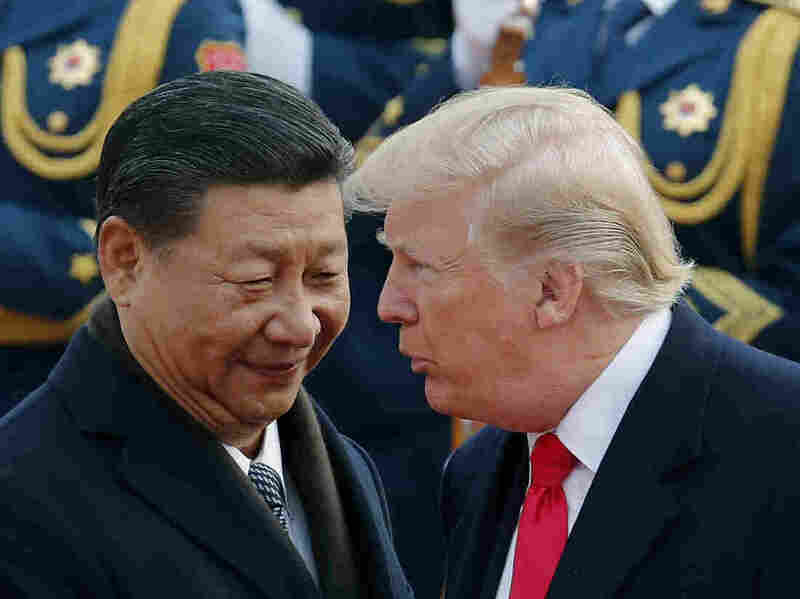 Trump Prepares To Get Tougher On China Over Trade Its competitors often complain that unfair trade practices have helped China become the world's top exporter. Now, the Trump administration seems increasingly likely to confront China on trade. President Donald Trump chats with Chinese President Xi Jinping during a welcome ceremony in Beijing on Nov. 9. The Trump administration is expected to release the results of an investigation into Chinese trade practices, a move that could lead to sanctions. The Trump administration is expected to release the results of a seven-month investigation into Chinese trade practices, under Section 301 of the Trade Act of 1974, a move that could lead to sanctions against the country and provoke retaliation by Beijing. The actions could come within days, according to a source within the administration. "The Trump administration has made it very clear that it believes that it has the authority under Section 301 to threaten and/or impose tariffs on China directly over these practices," says Edward Alden, senior fellow at the Council on Foreign Relations. Section 301 gives the president wide latitude to impose penalties such as reciprocal bans on cross-border investments and tariffs on a wide variety of Chinese goods, Alden says. The U.S. also could band together with allies to force China's hand at the World Trade Organization. Countries in Asia, Latin America and Europe have long complained that Chinese trade practices such as forced transfers of technology, illegal government subsidies and dumping of low-cost exports weaken competitors. Trump trade adviser Peter Navarro, a staunch China critic, says, "I think there's a widespread and growing consensus around the world that China is not playing by the rules and that together we as allies and trading partners need to take many, many different kinds of measures to ensure a level playing field." Trump has been excoriating China for years, accusing it of blocking access to its markets for foreign companies. Once in office, he has been slower to match his rhetoric with actions. His administration failed to label China a currency manipulator, even though Trump promised to do so during the campaign. He may have hesitated in part because he needed Beijing's help with North Korea, and because the prospect of a trade war scares U.S. companies such as Boeing, which earn a lot of money in China. But a clash seems almost inevitable, given China's outsize role in global trade. The U.S. recently imposed tariffs on steel and aluminum imports. The vast increase in production of the two metals by China in recent years has helped lower their price globally and hurt U.S. producers, the U.S. says. "If you're concerned about the large U.S. trade deficit, which the president is and has said he is repeatedly, most of that's a China problem," says Alden, of the Council on Foreign Relations. In December, the administration released its national security strategy, which for the first time labeled China an "economic aggressor," Navarro noted. The paper said, "We will work with our partners to contest China's unfair trade and economic practices and restrict its acquisition of sensitive technologies." Still, any move to punish China carries risks for the United States and the world as a whole. The countries of the world have spent decades carefully crafting laws meant to regulate the flow of trade, notes Dan Ikenson, director of the Cato Institute's Herbert A. Stiefel Center for Trade Policy Studies. Disputes between nations are meant to be settled at the World Trade Organization. If the U.S. opts to act on its own, it could undermine the infrastructure of global trade in a way that causes more problems than it solves, Ikenson says. "My main concern is that we actually go forward with these unilateral duties, and the rest of the world sees the United States as disavowing the WTO, China retaliates and so the costs start to spread across the U.S. economy," he says. While China has sometimes shown it's willing to change some of its more egregious trade practices, it's also made clear it will go at its own pace. Too much pressure from Washington is likely to be seen as bullying by Beijing and could invite retaliation against U.S. companies. But after lobbing so much criticism at China over the years, Trump may feel he has little choice but to take action of some kind. As Navarro sees it, such action has been a long time coming. "It's staggering — staggering — what China does in terms of cheating the international system, and it's refreshing that we finally have a president that is standing up for all the American people and standing up to China on all this," he says.